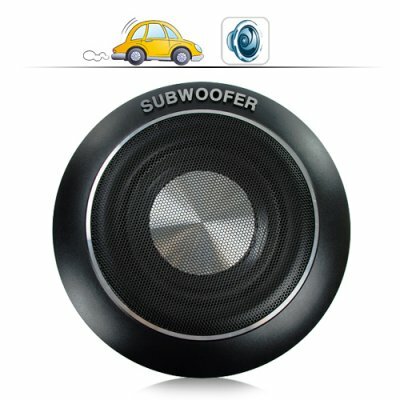 Successfully Added 6 Inch Car Audio Subwoofer to your Shopping Cart. 6 Inch Car Audio Subwoofer. Perhaps the single most important upgrade you can make to your car audio sound system is to add a subwoofer. We are proud to present this compact sized amplified subwoofer to provide you with a phenomenal audio experience. With this 27cm sub that is just 7.1cm deep, you can boost your car audio with 140W of pure, solid sound. With its impressive power handling and an output of up to 140W (70W x 2), this affordable subwoofer will enhance your car audio enjoyment with its clear and responsive bass. Ignite your car audio system with high performance sound! Designed for enclosed use, the sub woofer is easy to install, and there is plenty of scope for optimal sub woofer placement in your car. Locate the sub woofer under a seat to really feel the beats! With a combination of new technologies and materials, this sub woofer is ready to produce clear, low distortion reference sound quality to provide both tight and deep bass. The price is right, the look is right and the performance is superb. If you're adding pulsating music to your existing car entertainment system, then this affordable compact sized subwoofer is the one! Brought to you by the leader in wholesale direct from China Electronics, Chinavasion. This is a perfect subwoofer. Very good quality and price. Easy installation. An easy and chip upgrade for your existing car audio system. I recommend it 100%. This is what you need to boost up your bass without change your speakers or your headunit.Συστινεται ανεπιφυλακτα!!!! !